The power of network TV is still unparalleled online – will it ever be? From time to time, you’ll hear reports of the death of mainstream media. Newspapers are dying, radio is on the way out, network TV ratings have shrunk dramatically etc. In most studies we learn that people are spending more time online and less with the “old media”. All of this is true, but only to a point. The power of television, in particular, to drive behavior is still quite stunning. In 1981, MTV launched to very small audience with an old, not very popular song as their first video: “Video Killed the Radio Star” by the Buggles. Record stores reported large numbers of customers asking for the song and ordered up records to meet their customer’s needs. Record company execs started calling MTV asking how to get their videos on. A hit was made. Now, 27 years later, we have plenty of internet stories that–while not quite that large–show that the internet has the potential to do the same. e.g. Fall Out Boy clamored itself up through Myspace. Something this week caught my eye. Hallelujah, a 14 year old song from the late Jeff Buckley has been the #1 seller on iTunes for a week. There’s been no promotion in the iTunes store. How? Well, an American Idol contestant sang an adequate cover of the song. And then, Simon Cowell mentioned that Jeff Buckley’s 1994 version is one of his favorite songs. From nowhere to #1 overnight. Keep Facebook Fun! or No, I won’t be your friend. After a year or two of “social network fatigue”, a new network is spreading virally again: Facebook. Everyone’s talking about how Facebook is spreading (again) like wildfire. A couple of years ago, it spread through colleges around the US and a staggering majority of college students now have a facebook. Now, the old people are arriving, and more specifically, everyone in my LinkedIn network is asking to be my facebook friend. (yes, I just called all of you old). This has made me pause and ask “What do I want my Facebook network to be?”. I’m on a lot of services and I actually have different groupings of friends on each. I use one service for my long lost NYC friends. I use LinkedIn for my professional network, and what do I use facebook for? So I just started doing the unimaginable, I’m turning down invitations from people I know well. I’m clicking “REJECT” to those professional contacts. I want my facebook to be my closest friends (professional and personal). I want it to be a fun place, I want to know what music they are listening to, what they are doing, restaurants, fun stuff. I’ll use a professional network for those professional contacts. I want to keep facebook fun! LinkedIN CEO Bill Nye unsurprisingly agrees. Since I do want to be friends with you (I like you, trust you and want to keep in touch), I’ll kindly invite you to LinkedIn instead. So don’t be surprised to get a REJECT from Facebook and a INVITE from linked in. I wonder if other people are feeling the same. What do you use Facebook for vs. linkedIN?? It’s amazing to me to note how much Valleywag has become a “must-read”. Almost everyone I know reads Valleywag on a daily basis and even those that won’t admit it later give themselves away with a “I heard that…” quote that came right off of the Valley’s gossip rag. Even more amazing is how often the rumors are right. Now that we all read it, I guess that means many more tipsters and people to correct the mistakes. While I’ve been thinking about the Valleywag phenomenon lately, I got an up close and personal reminder on my drive home yesterday. I was driving 280 north and a Silver Mercedes SL 55 passed me. I’m a fan of that car (actually, I lust after it), so I paid attention. Then I noticed the license plate was missing and in its place was a bar code. Hey, I read about that on Valleywag – everyone was stealing Steve Jobs plates, so they put a bar code on instead. Was that Steve Jobs? Well traffic changed and I was able to pass him and it was indeed Steve Jobs. If it wasn’t for valleywag, I probably wouldn’t have taken a second look, but well, Nick Denton has turned me into a valley-star-stalker. I watch the Today show nearly every day, and I saw you on the Today Show today. A coup I’m sure to get onto America’s #1 morning show being interviewed by Meredith Viera. You even brought your mom and sister in tow. So kudos to your PR team for getting that setup. But it stopped there. Why? Valleyspeak. It was clear that your PR team coached you in how to talk to the press, you got your “key messages” across. You brushed off the Yahoo acquisition rumors with aplomb. But it was all in that doublespeak that you only hear here in the valley (hell, I speak that way too). This wasn’t the business press you were talking to, this was a mass consumer audience. They don’t care about technology, or the technical challenges, or the “focus on your users”. They want to hear why they should care. You were sandwiched between a segment on plush toys for 6 year old girls and a martha stewart segment. You needed to talk about the fun things people do on facebook. Examples of chance encounters, long lost friends meeting, how a group got someone a job and another saved a life. You needed to talk about the profound impact that Facebook has had on you as a user. You needed to answer Meredith’s most important question “Why would I use Facebook”. She ended your segment saying, “well I still don’t know why I’d use this thing”. That’s your PR rep’s fault. They should have prepped you. When Good Morning America calls you next week, make sure they do. P.S. It is obviously easier for me to comment as a viewer and I know how hard it is to deal with consumer press. But Facebook has a real opportunity, just take it and run! When Google first acquired MeasureMap (and hired Jeffrey Veen), I wrote this post called: Really? Measure Map + Google. Google hasn’t had a great history digesting acquisitions (neither has my company) and I was concerned that Google would screw this up. Also, while I saw potential in MeasureMap, I didn’t think it met the expectations that they set for themselves. Well, I am happy to have been wrong. The new Google Analytics is truly a case of 1+1 > 2. Jeffrey Veen and the whole Analytics + MeasureMap team really came together and created a beautiful, functional, and useful analytics package. I’ve long used Mint on my site, but I’ve recently started using GA along side it and I am fast becoming a fan. There is tons of info, tons of ways to slice and dice but yet it feels incredibly simple. One issue (but this was there with Urchin) is that there are still too many features, but they have done an amazing job of hiding the complexity from the average joe (or Scott). Navigation Summary shows entry points and where users clicked next – a complex concept well executed. So, Google, and Jeffrey, I take back my doubt. Acquisitions are good for companies when they produce these kind of results. Now, lets hope for DoubleClick’s, and Aquantive’s and Right Media’s sake that this turns into a trend. While that video conference last week wasn’t that productive, I did get a chance to meet an interesting entrepreneur who shared a great story with me (and hopefully he doesn’t mind me sharing it here). He runs Diet.com, a great URL and a community site targeted at–you guessed it–dieters. The site has lots of features, from diet blogs, to reviews of diet products, recipes and diet tracking tools. The most interesting thing he shared however was how he approached his new video feature on his site. His staff produces little videos (like this week’s “Kitchen Raiders” which helps you cut bad foods out of your house). They then take these videos and post them on YouTube. THEN, they embed them on their own video page and their own homepage. So what? Well, first they don’t have to deal with the mess of hosting their own videos. Second, by posting it on their homepage for their millions of users, all of their videos end up in the youtube “most watched” list for that day. It’s a great free marketing tool for them – they produce high quality content that people want, they show it to their own very interested audience, and their audience makes it popular on YouTube, which introduces them to lots more interested people. It’s creative and really simple. I like it. Oh, and here’s that video. Remember no costco size bags of transfatty foods. Which conferences / meetups / unconferences should I attend? As I mentioned, I’m trying to get out more and hit a few more confereces. I see it as a good chance to meet people and maybe learn a thing or two. And I’ve been thinking about Gel in NYC. Any others? later in the year? Which are you going to? Ok, so I’ve fallen off the blogging bandwagon. One of my New Year’s Resolutions (apart from losing weight, visiting my mom & dad more, spending more quality time at home) is to blog again. Since I took my new job, I’ve really stopped writing and I want to fix that. I’ve got a lot of saved up blog posts in my head, I just need to get them out. What gave me the kick in the pants today, was that Don Loeb blogged that Feedburner’s Site Stats are now live. It didn’t take me but a minute to get it set up on this blog. I had been using Measure Map and had been pretty pleased, but I kinda stopped looking at the stats. It was kinda cool to know them, but not earth shattering (unless Dave Winer linked to me). So hack day is on and I definately felt that spirit in the air. After a day of amazing sessions about our APIs and UI framework, everyone gathered in URLs (our cafe) to have pizza, meet each other and start hacking. I met lots of interesting people and the place was swarming with press and media (I didn’t expect that much press). Then the “surprise” entertainment was on. 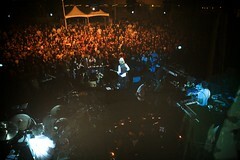 Beck performed an amazing one hour set on Yahoo’s lawn. He was backed by his full band and marionette versions of each band member. It was an awesome show – beyond just a simple concert. To cap it off, Beck’s puppets made a little video on our campus to celebrate hack day – very funny. This afternoon we’ll have the hack presentations, and I don’t think anyone knows what we’ll get, but I hope that spirit continues. P.S. I took tons of pictures, but there were so many people with much better pictures, I picked this one as one of my favorites. Two weeks ago, Yahoo held its quarterly internal hack day. Today Yahoo! holds its first Open Hack Day. The first I ever heard about a hack day was from Ken and the Jotspot guys. They had a hack day to have some fun and work on something that wasn’t on their normal “to-do list”. It was a great idea to innovate and give the team a breather from the day-to-day. As most people know by now, Yahoo took up the idea and now we’re sharing it with the world. I sat in the audience for this last internal hack day. Of course I was impressed with all the amazing ideas and hacks I saw. Of course I saw tons of hacks that I thought could be integrated into real products. Of course some of these ideas showed real promise and could translate into real business value. But, I was much more amazed at the feeling in the air. One of the best things that Chad, Caterina and Leonard have created is a feeling that everyone’s ideas have a place and everyone’s work deserves to be shared. Hack Day is a forum to share your ideas with a large audience and in front of Yahoo execs (this hack day was judged by Jerry Yang, a few SVPs, Sue Decker our CFO and a few other rockstar Yahoos). You could tell that all the people in the room were stoked to be sharing their ideas. But people in the room were also stoked to be seeing other Yahoos work. Everyone was supportive of their peers and I think everyone went back to their day jobs better off for it. The HAck Day team is making every Yahoo more innovative. Now, in just a few hours, we’re starting Open Hack Day. Hundreds of developers from all over are coming to camp out on Yahoo’s campus and to hack using Yahoo APIs from YDN. Just like our internal hack days, I expect to see lots of great hacks. But I’m most excited to see that feeling in the air. The day starts with sessions about how to use our APIs, then people get settled in, then awesome entertainment and the hacking begins. The presentations take place on Saturday afternoon and I look forward to seeing people from different companies (sometimes competitors of each other) creating that supportive space – that feeling in the air. If you’ll be here, please come up to me and say hi, and happy hacking. Let’s make it a place where everyone gets to shine.